This is getting a little long in the tooth, but I wanted to show you out of town folks this year’s Hill Hardware scarecrow. Mary Anne and I have to come up with a new idea every year for our sidewalk scarecrow at the store. 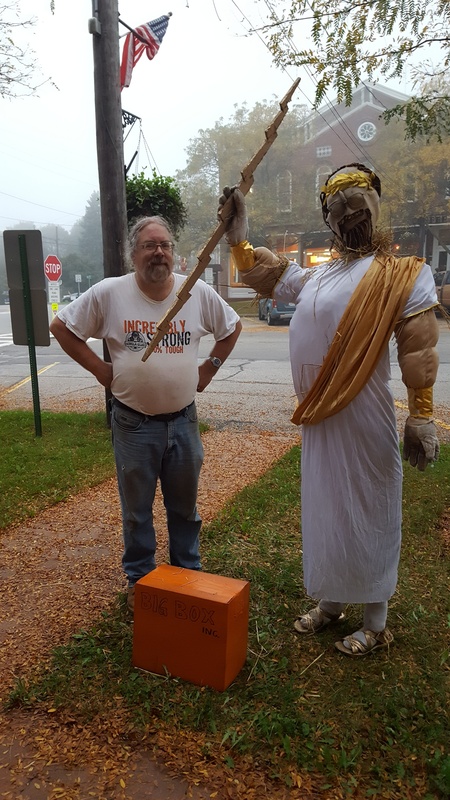 You see, the Burton Chamber of Commerce tries to get all the uptown merchants to put up a display every year to get folks into the Fall mood. Not everyone does it, but we like to. 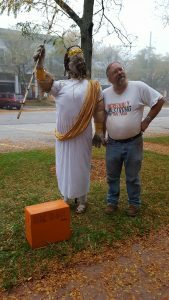 This year Mary Anne decided that our scarecrow (who happens to bear more than a passing resemblance to yours truly) should be a real God. 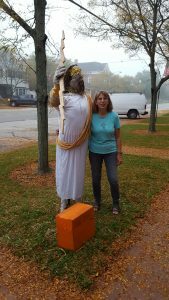 In fact he would be Zeus, king of the gods. I decided to have him punishing a “big box” store by smoting it with a bolt of lighting. We found a toga costume and I made a big box store out of, what else? A box. 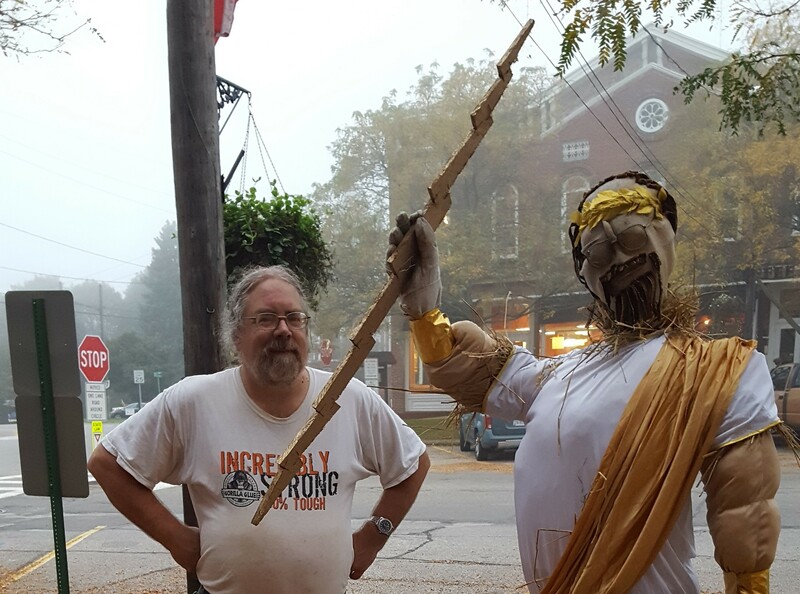 The costume didn’t come with a lightning bolt, so I retired to the store workshop in the basement and I created one out of a little plywood and some gold paint. The hard part was setting it up right. Just standing one up isn’t that hard, although I always feel a little funny about sledgehammering a steel fence post into the public tree lawn on Main Street. You’ve got to get it anchored really well. It’s one thing to get it to stand up on a sunny afternoon, but remember, it’s got to stay up a whole month. Imagine your scarecrow, soaked with 50 pounds of rain, being lashed by a 40 mile per hour wind and it’s got to stay up. I think we lost one once, but we do pretty well.